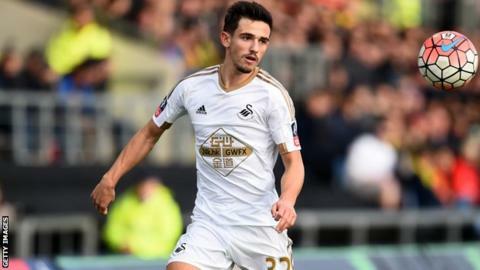 League Two side Yeovil have re-signed Swansea and Wales Under-21 right-back Liam Shephard on a one-month loan deal. Shephard, who made his Swansea debut in the FA Cup third round defeat by Oxford in January, made 20 appearances for the Glovers in a loan spell last season. The 21-year-old has won two caps for Wales at under-21 level. He will not be available for Friday's game against Carlisle, as international clearance has not been received in time. "Both The FA and FAW are assisting the club in trying to contact FIFA offices, who are now closed due to the holiday season in Switzerland," the club said in a statement. "With today being the final day of the loan window, the club are very disappointed that the offices at FIFA closed early, causing problems for clubs ahead of a busy weekend of football." Yeovil are 20th in the League Two table, 11 points above the relegation zone with nine games to play.